This time of year when my crafting routine is in overdrive, I spend countless hours in front of the computer fiddling with Christmas Silhouette cut files. I love making images and fonts fit together, its a whole different creative side of me… and one that my husband doesn’t mind the mess of! My life has been a bit of a chaos story these last few months (two break-ins, a flooded basement, a busted varicose vein, a camera accident… cue the violin), long story short, bloggy life has taken a back burner and my Christmas sharing hasn’t materialized. Today I decided to bundle a few of my Christmas Silhouette Cut Files into one and share them before the season totally gets away from us. 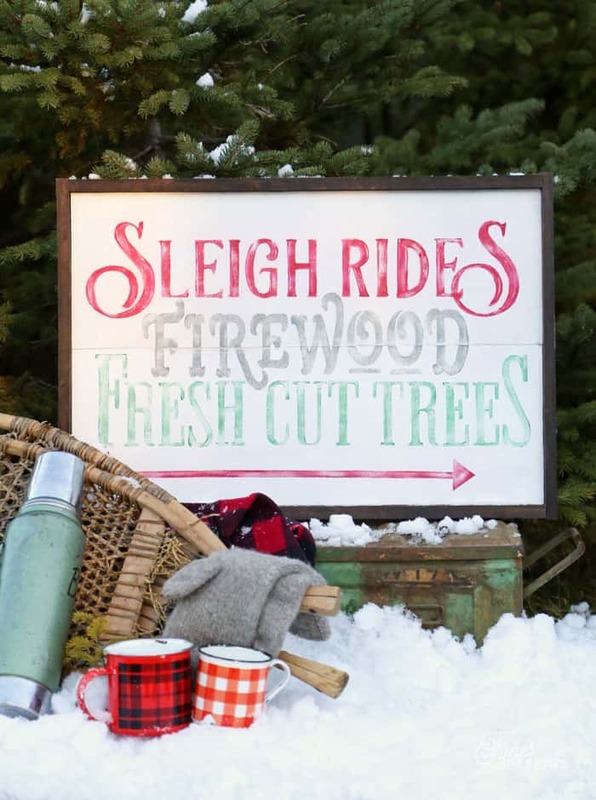 I totally know your house needs one (or all) of these signs right now… haul out your supplies because you’re going to love them! 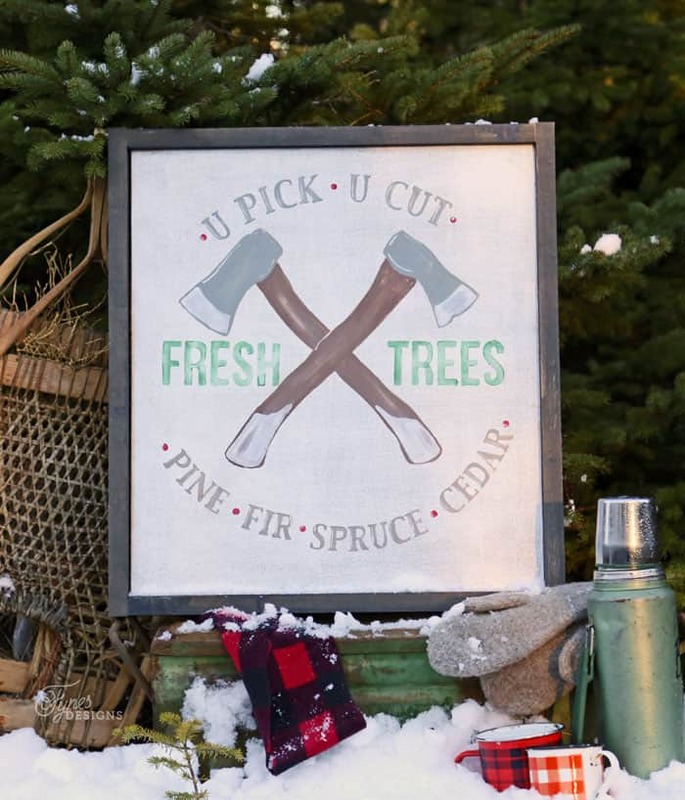 First up is this on the farm sign, Sleigh Rides, Firewood, and Fresh Cut Trees, your one stop shop! Wouldn’t this look great on your mantle? 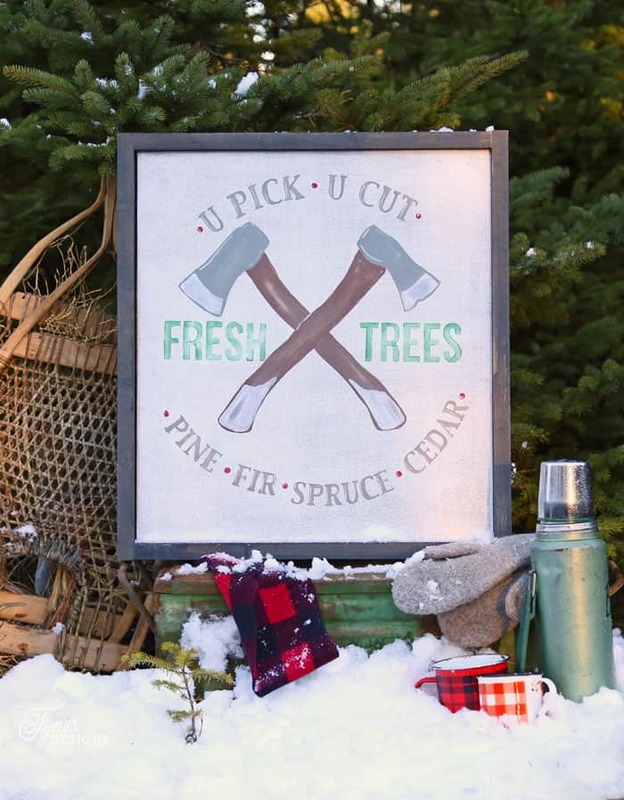 Next, another woodlot sign, this one is for the lumberjack in all of us. Get out your doe skin jacket ladies! 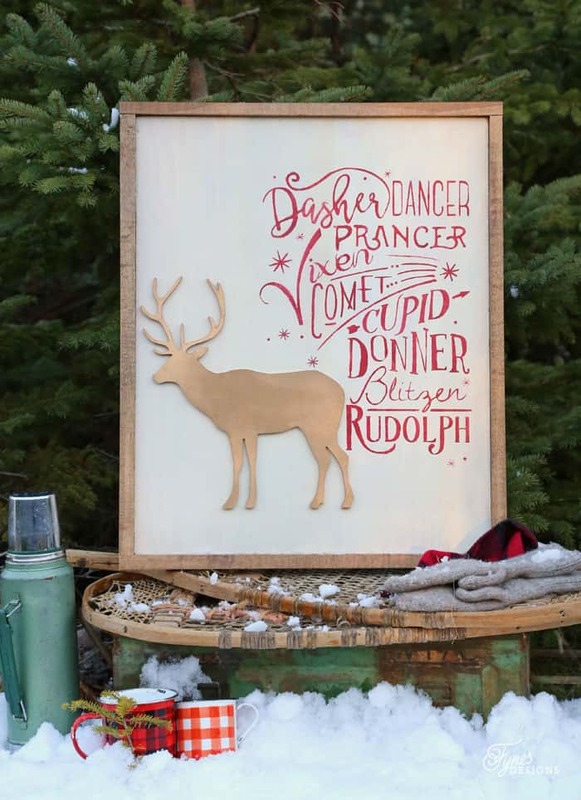 This Reindeer sign is a personal favorite of mine. I wish I could take the credit for the initial idea, but I had seen something similar on Pinterest and for the life of me can’t find the image. If I got this idea from you, please let me know so I can credit you! 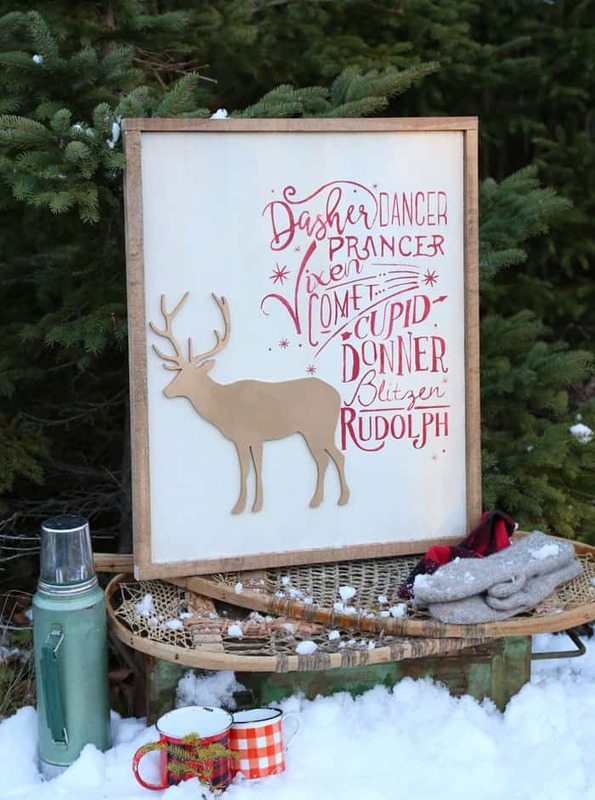 Please tell me you have a Silhouette so you can create these Christmas signs?1 If not CLICK HERE. You’ll see in the download, but this file is actually designed to be taller with the reindeer under the phrase so the curve of the ‘R’ is on his back. Didn’t plan the sign out very well. Please subscribe to Fynes Designs. You’ll be the first to know about everything Silhouette I have going on. Including free files, cool project ideas, new products, sales, promo codes etc. Please Pin this image below, share the love! When you create something, please snap a pic and share it on Fynes Designs Facebook page or on Instagram and tag me @vfynes. I love to see what you create, it makes me feel all warm and fuzzy, plus I’d love to get to know you better! Leave me comment here, they make me feel fuzzy too! Download the Christmas Silhouette cut files here. You make the most beautiful cut files! I love your painted signs. Each one always make me want to make one just like it. Thank you so much Cindy! Glad you stopped by! Do these have to be printed with a Silhouette? Thank you for sharing! These are really cute and I am into making art for our home. My granddaughter will love the reindeer one!! Thank you SO much for sharing these great cut files. I look forward to using them. They are all so cute I can’t decide which one to do first, but I’m leaning toward the Santa Supply Co. Merry Christmas to the Fynes family! Thanks Patti! I’d love to see what you create! Merry Christmas! I love your signs! 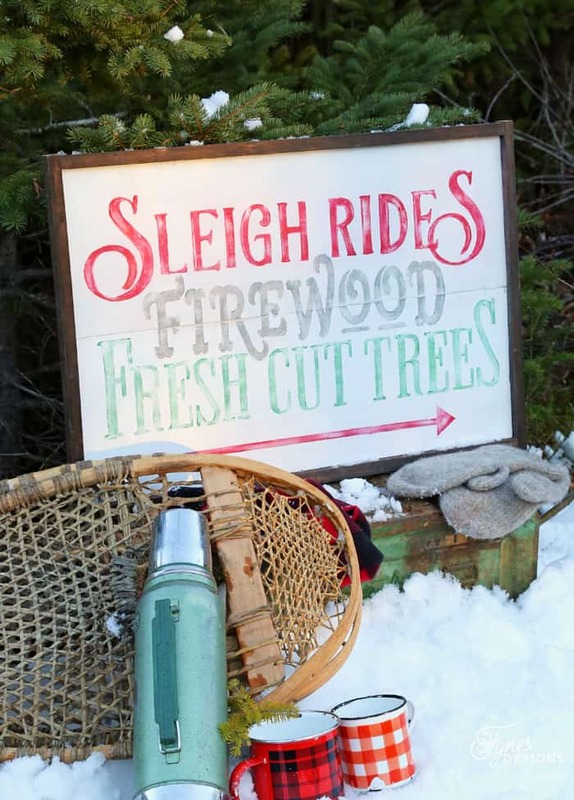 I would love to make the sleigh rides sign. I don’t have a silhouette, but I did pin your signs. Thank you! Thank you for stopping by the Oh My Heartsie Linky Party to share, these are really fun!! I don’t currently have a Silhouette, but I definitely need one now! LOVE all your signs! Pinning! Thank you so much for sharing at The Wonderful Wednesday Blog Hop! I love these signs. Santa’s reindeer is favorable. Thanks for sharing on Sunday’s Best Linkup. I look forward to your posts. Oh my goodness.. I adore these!!! Ok, so quick question: I have a Silhouette, and forgive me for my Silhouette ignorance here… but do you cut the files and use them as a stencil and paint all of these??? Or what do you use to make the actual signs, and canvas bag? I could totally use the heat transfer vinyl for the bag I’m sure, but I just want to make sure that’s what you do, and what you use for the signs! Hey Jessica, you’re exactly right! Stencil for the signs and HTV for the bags… or thats what I would do anyhow! Thanks so much for following! I love the mixture of the fonts you used for this design and I think they would be nice for a project I am working on. Would you be able to tell me which fonts you used? beautiful designs, love it all! Hi! I’m interested in making some of these. Do you have licensing fee for commercial use? Hi Ashely, Please use the files for local fairs etc, but please no online sales. Hi I love your Christmas files you share. I know the Santa Sack Cut Files is personal use only. I would like to know what about the rests of the files like Chrismast trio, Santa Supply 1 and North Pole Trading. Thank you! Same, personal use. However if you’d like to use the files to sell locally I’m fine with that, please no online sales. This is the first time seeing your designs and I am loving them!!! Thanks for sharing! I love your signs! Approximately how large are these? They are roughly 24 x 32ish, but you can make the file any size you want! I ABSOLUTTLY LOVE YOUR STUFF.. KEEP UP THE GOOD WORK. How do i sign up for the email list? I love your designs and want to get access to your cut files . Loving your designs….am I too late to take advantage of the free downloads???? I love these designs 😀 They’re so cute & you’re amazing! Hope I am able to get access on Google Drive for the files. Would love them in my home! I love these designs! How can we download the files? I’ve liked your page on FB and even pinned them on Pinterest but I can’t figure out how to access the downloads. There is a download at the end of the post. Right before the Etsy image. Thanks! I too would love these! Requires permission to view folder and/or files. I have requested, but wanted to make sure I got in line-my little boys would love having these hanging by our tree soon! these are awesome I to love to design fun things! I have a cricut maker. cant share with it. but i would love to. I am learning in inkscape so I can share my stuff lol but time restraints on my learning curve. keep up the great work love them!